I did it! I made a dress I will actually wear and feel comfortable in. And as proof, I've already worn it on three occasions! This Sunday I managed to get some photographs to share the good news with you. This is the Staple dress by April Rhodes, which you can purchase via download from her website. It's been popular with lots of makers, and I can see why. It's a really easy sew, and the fit is so forgiving. I was in between sizes, but the pattern explained how to blend the best bodice size with the best skirt size. Easy peasy. I made my dress in Rifle Paper rayon from Crosscut Sewing Co. This is Paint Roses Orange, but they also have Paint Roses Black. Both are on sale now for $12 a yard! Is it hot? Well, yes and no. In the south we're always hot and humid in the summer. I feel no qualms about wearing this in the heat. It's breezy and short. As rayon challis is made of wood pulp, it's more breathable than polyester. I admit that lightweight voile would be cooler. Maybe I should try that next? But then it would need to be lined, I think, which might negate the advantage. And boy does voile wrinkle! The staple dress is literally one big front piece and one big back piece. 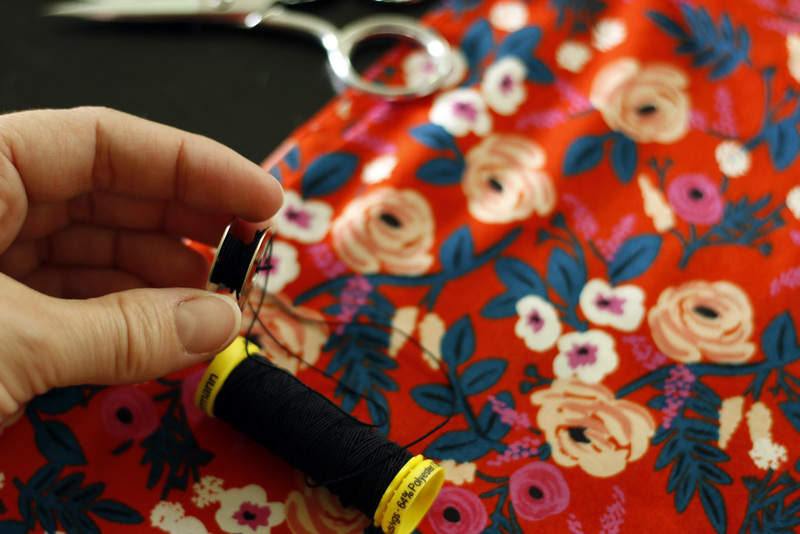 After joining and hemming the pieces, you simply add the waist with elastic thread. I'd never used elastic thread, so I was a little nervous. You do have to hand wind the bobbin, but that's about the extent of the fuss. It sewed up without any trouble. For sure, I'll make another Staple dress. I'm just waiting for the right fabric to announce itself. Meanwhile I do have a few Art Gallery garment fabrics awaiting my attention. I think a skirt is next... if I can pull myself away from patchwork, that is.